Count Arthur Strong, showbizness legend, raconteur and former variety star, is set to take to the Palladium stage for the 2016 Christmas season. Arthur is to star as Baron Hardup in Cinderella as Panto makes a return to the London Palladium for the first time in three decades. This is Arthur’s first ever panto and he joins a 32 strong cast including Paul O’Grady as The Wicked Stepmother, Julian Clary as Dandini, Lee Mead as Prince Charming, Paul Zerdin as Buttons and Nigel Havers as Lord Chamberlain. 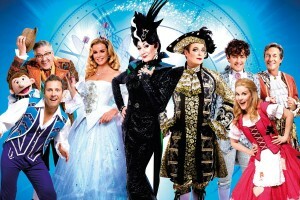 Natasha J Barnes will play Cinderella, the Fairy Godmother will be Amanda Holden (or is that the other way round?) and the Ugly Sisters will be Suzie Chard and Wendy Somerville. The London Palladium has always featured heavily in Count Arthur’s recollections of the heyday of Variety. In 2006 he even set his sights on putting his life to music on variety’s most famous stage in Count Arthur Strong The Musical?, something he may well yet achieve. Having launched the comedy character in 1997, Steve Delaney has turned his ‘riotously funny’ creation from Edinburgh cult hit into a cornerstone of BBC comedy. Over fifty episodes of Count Arthur Strong’s Radio Show! have been produced for BBC Radio 4 and the third series of his eponymous TV sitcom returns to BBC1 this autumn.